Even though the idea that inflammation causes depression is reasonable and justifiable, things have a tendency to go off the rails when it comes to popular explanations for why it does, and what should be done about it. The truth is however, it isn’t always possible to make a black and white distinction between metabolic symptoms and causes, and this is relevant to the relationship between inflammatory processes and mood disorders like depression or anxiety. Many symptoms (or biochemical changes) resulting from stress or metabolic suppression, go on to promote further interference with metabolism, and because of this, it can sometimes be difficult to know for certain what caused what. The good news is you don’t necessarily need to know which came first, inflammation or depression. If you take a more holistic approach, and look for the deeper biological processes (capable of driving a number of interrelated problems), it’s possible to see that there are good reasons why inflammation is closely associated with depression, and that there are things that can be done about it. One recently fashionable suggestion is that an infection of some kind is responsible for the inflammation, which then leads to depression. Although this is likely a valid argument, it’s worth discussing the elements which could be behind the simultaneous promotion of all three of these things (infection, inflammation, depression) and more. The proper functioning of thyroid energy system metabolism is a central factor protecting against chronic and systemic inflammation, as well as potentially being an essential part of the defense against infection and mood dysregulation. Exposure to stress causes blood sugar to be used up at an increased rate, and this is more so the case when metabolism is already under functioning. When blood sugar runs low, the stress hormones cortisol and adrenalin, increase to assist in providing needed alternative energy. High cortisol has been shown to be involved in the etiology of depression and other varieties of mood disorder. Stress and hypoglycemia play a significant role in the promotion of thyroid dysfunction and depression, and high cortisol and hypothyroidism often fuel eachother. Cortisol can promote inflammation, and inflammation can also promote cortisol. Stress promotes adrenalin, and adrenalin increases the release of stored polyunsaturated fats (PUFAs) into the blood stream, causing thyroid suppression and inflammation. The breakdown products of the polyunsaturated fats have been associated with depression, and are one of the main things behind chronic blood sugar dysregulation issues. Stress can promote hypoglycemia as well as hyperglycemia, and both low and high blood sugar can potentially lead to an increased susceptibility to infection. Infection is known to promote increases in cortisol and inflammation, and an energy metabolism suppressed, inflammatory state, is far more susceptible to infectious disease. When stress, blood sugar dysregulation and the release of PUFAs exacerbate thyroid energy dysfunction, digestion often becomes sluggish. 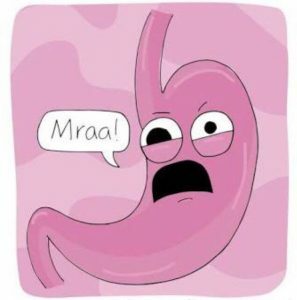 Ineffective digestion increases the tendency for bacteria and fungi to grow in number, and move up into the small intestine, where they encourage the release of potentially harmful and inflammatory substances, such as bacterial endotoxin (LPS). Increased endotoxin exposure has been shown to be connected to many metabolic factors related to stress and depression, as well as many other kinds of inflammation related illnesses. Endotoxin can directly promote infection, as well as causing levels of the stress substances such as serotonin and nitric oxide to rise. Serotonin, nitric oxide and endotoxin can all foster inflammation throughout the intestine (as well as systemically), and can cause interference with mitochondrial energy systems, leading to more exposure to endotoxin, stress, and inflammation. Suppression of energy metabolism can result in a reduction in intestinal barrier capability, allowing for bacterial endotoxin to be released in greater amounts into the system, leading to an increasingly generalized inflammatory state, and chronic interference with thyroid and immune system function. Eventually, this can create a vicious circle type stress situation, involving continuously increasing levels of inflammatory materials including endotoxin, the polyunsaturated free fatty acids, the prostaglandins and cytokines, iron dysregulation, and rising exposure to the stress substances including estrogen, nitric oxide and serotonin, all potentially promoting depression. All of these kinds of metabolic changes can potentially feed into a chronically blood sugar dysregulated high stress state, increasing susceptibility to many different (but related) kinds of inflammatory illness. Depression is in many ways an energy deficient, hypothermic, hibernation-like state, and although the popular belief that more serotonin leads to more happiness is extremely popular and profitable, experimental evidence suggests that high serotonin is a driver of mood instability (including anxiety and depression) as well as inflammation. Misinterpretations (as well as misrepresentations) regarding the significance of a few important biochemical processes (like for instance viewing serotonin or nitric oxide as something you want to increase rather than decrease) can be enough to prevent the pieces of the puzzle from falling into place. Science is now showing that popular antidepressants which increase serotonin levels are not only often ineffective in the treatment of depression, they can be responsible for a significant worsening of symptoms, as well as promoting inflammatory disease in general. Aspirin is known to protect against many of the diseases of stress and inflammation, and has also been demonstrated to have potential anti-depressant, anxiolytic, even antipsychotic effects. A failure to distinguish between the temporary reduction of inflammatory symptoms via immune system suppression, and a genuinely anti-inflammatory effect resulting from improvements in metabolic function, makes it likely that ineffective and counter-productive treatment methodologies for depression, continue to be popular. Misconceptions regarding the biological significance of a variety of substances, add weight to flawed arguments, such as those claiming that sugar promotes inflammation and mood dysfunction, and that fish oil is a beneficial, anti-inflammatory ‘medicine’, useful in the treatment of depression. Because whole fields of biological experimentation are largely ignored for political and financial (and other) reasons, this means important information remains unknown to many practitioners. Sugar (in the context of a metabolically supportive diet) promotes thyroid energy production and digestive function, and directly lowers exposure to the inflammatory substances of stress and disease (including bacterial endotoxin, cortisol, estrogen, serotonin, nitric oxide and the polyunsaturated free fatty acids), all of which have been shown to increase susceptibility to depression and other mood disorders. Continuously high levels of stress, and interference with thyroid energy systems, can increase activation of the sympathetic nervous system (suppressing digestion, impairing proper immune function and promoting mood destabilization) and some see depression as a kind of ‘allergy to modern life’. Many different kinds of modern day stressors – including high intake of PUFAs, greater amounts of radiation and chemical toxins and poisons in the environment, social isolation, authoritarian school and workplace cultures and other things – all have a part to play in relation to susceptibility to infection and inflammation and the high cortisol, high serotonin low energy states common to depression. Rather than trying to pinpoint one specific cause, examining the ways that things that inhibit optimal metabolic performance (including many different biochemical byproducts of suppressed metabolism) can be involved in inflammatory disease promotion in general, can make it possible for better approaches to healing to become known and available. Looking at the ways that chronic inflammation or infection can cause depression, will be far more powerful and illuminating in the context of an appreciation of the things that drive energy metabolism, and protect against stress. That way it’s then likely to become more obvious that the treatment of one metabolic issue, will also usually become a part of the treatment of metabolic issues in general. It isn’t that inflammation and infection do not fuel depression. I would say they all feed each other in a circular fashion, and that’s one reason why they can be challenging to fix. The one thing they all do have in common is metabolism, because metabolic function impacts upon the whole system. And so it makes sense to me, to question whether things proposed for therapy, are working in the same basic metabolic direction (improving thyroid function and energy metabolism) rather than encouraging opposing forces, potentially limiting recovery. A diet avoiding PUFAs, and restricting difficult to digest grains, seeds, nut, legumes and under cooked vegetable matter, with enough protein from milk, cheese and gelatinous meat, and plenty of sugar from sweet fruit, fruit juice and white sugar, is one way to go about moving metabolism in the right direction. Some other things that can help promote energy metabolism and protect against inflammation and depression, include antibiotics (like minocycline), activated charcoal, methylene blue, cyproheptadine, glycine, red light, niacinamide, coffee and caffeine, thyroid hormone, pregnenolone and progesterone, raw carrot fiber, well cooked mushrooms and more. I’m no expert, but the way I see it, it doesn’t really matter so much whether an infection caused the inflammation which lead to the depression, or whether the depression was the result of some other form of ongoing stress. It’s all relevant, and can all be helpful information, but improving metabolism can work, without necessarily knowing the exact reasons why. Mild hypothermia promotes pro-inflammatory cytokine production in monocytes. Endotoxin- or pro-inflammatory cytokine-induced sickness behavior as an animal model of depression: focus on anhedonia. The role of endotoxin in infection: Helicobacter pylori and Campylobacter jejuni. Prostaglandins mediate depressive-like behaviour induced by endotoxin in mice. Role of serotonin in intestinal inflammation: knockout of serotonin reuptake transporter exacerbates 2,4,6-trinitrobenzene sulfonic acid colitis in mice. In vivo serotonin release and learned helplessness. Cytokines, prostaglandins and nitric oxide in the regulation of stress-response systems. Serotonin, inflammation, and IBS: fitting the jigsaw together? Are there differences in lipid peroxidation and immune biomarkers between major depression and bipolar disorder: Effects of melancholia, atypical depression, severity of illness, episode number, suicidal ideation and prior suicide attempts. Nitric Oxide and Major Depressive Disorder: Pathophysiology and Treatment Implications. Causes and consequences of low grade endotoxemia and inflammatory diseases. Increased estrogen level can be associated with depression in males. alpha-Tocopherol administration produces an antidepressant-like effect in predictive animal models of depression. Changes in serum cortisol levels during community-acquired pneumonia: the influence of dexamethasone. Antidepressant-like effect of α-tocopherol in a mouse model of depressive-like behavior induced by TNF-α. Inflammatory markers in patients with hypothyroidism and diabetes mellitus type 1. No effect of n-3 long-chain polyunsaturated fatty acid (EPA and DHA) supplementation on depressed mood and cognitive function: a randomised controlled trial. Metabolic syndrome and major depression. Increased plasma nitric oxide metabolites in suicide attempters. Thyroid hormones and the interrelationship of cortisol and prolactin: influence of prolonged, exhaustive exercise. Neural response to emotional stimuli during experimental human endotoxemia. Next story Calories, Unicorns and Other Myths. Previous story Is It Time To Start Calorioting?